« L’eusko : une monnaie locale basque, écologique et solidaire pour relocaliser et réorienter une partie de l’économie. TRANSITION FREE PRESS IS OUT! Transition Free Press (TFP) Issue 1 is published today 1st February 2013. 11,000 copies of our brand-new 24 page newspaper has now been printed and bundles have been distributed throughout the UK. Like most things in the garden, Transition initiatives tend to be more reflective and dormant in January, as is reflected in this month’s roundup. We’ll start this month’s Round-up with 3 articles from the Japanese newspaper Asahi Shimbun, created by their Paris office about Transition. Its official, the European Economic and Social Committee (EESC) loves Transition towns. What does that mean? We don’t know! Calling all drupal-friendly developers – front and backenders – you know who you are! What is this Resilience, anyway? In Transition, when we talk about resilience, we usually think of it on the level of communities. In July 2010 I was facilitating a 2-Day “Training for Transition” course in London with my wise and wonderful colleague Teen Ross. I hadn’t been sleeping well for months and by the end of this particular course had barely slept for 3 days. For the last seven months I have been a Transitioners without an initiative, I have been going it alone. I have had the support of my lovely friends and family, but I haven’t been able to contribute to local community resilience building. Wet feet, cold baths and lukewarm soup – resilience in Lancaster? There’s something about resilience that makes me think of cold baths, wet feet and the distant prospect of lukewarm vegetable soup. And the word, defined first in the dictionary as « the capability of a strained body to recover its size and shape after deformation, » only adds to the depression. It’s early January and I’m sitting in the Green Dragon pub at Sustainable Bungay’s first event of the year, a Green Drinks session on the theme of Well-Being and the Community. Like most Transition projects, it started with a ‘Why don’t we … ?’ conversation. Downham and Villages in Transition? One Woman’s Winter Musings. Nayland is a quintessentially English village in Suffolk. Set in the heart of Constable country within an Area of Natural Outstanding Beauty, the village contains over 100 listed buildings, many of them timber framed, with parts of the village that remain relatively unchanged since the 16th century. “Seeing the cat” has served as a metaphor for achieving an understanding the teachings of Henry George since he set them out in his bestselling economic treatise “Progress and Poverty” in 1879. This new handbook about the collaborative arts and Transition will begin its first chapter at Lumb Bank in the Calder Valley in early March. 12 artists, 2 tutors, 2 guest speakers. 1 author, 1 editor will converge to share their stories and practices in a ground-breaking co-operative work. What is our story? How do we make stories and how do they make us? What are the myths of progress we live by and and what new ones can we forge that will sustain us and life on earth? The book questions deeply what the use and function of art is in times of planetary shift and social change. There is something very intense and creative about this weather that brings you closer to people and life. Last September Transition Ipswich and Woodbridge launched a challenge to themselves and local groups – could they source everything we eat locally? Mark Watson in heroic mode, splitting the wood. 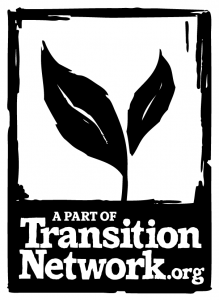 Transition THRIVE course – last days to book! Costs: £105 for both days (Please contact us for bursaries!). This is our original training with lots of practical ideas on how to set up, run and grow a Transition Initiative. It is also useful for people who have recently become involved in Transition and want to develop the essential skills and insights to help their initiative become a success. Click here for more info. Costs & Booking: £105 for both days (Please contact us for bursaries!). This two day workshop is for anyone interested in the inner aspect of the Transition process who wants to deepen their understanding of this area, connect and share experience with others, and be inspired to take the next steps for themselves or their group. The territory of “Inner Transition” is broad, powerful, fascinating and sometimes challenging to define, to explain or to organise. The film’s UK distributor Dogwoof have told us that they have already had a lot of interest from Transition initiatives, and have set up a special offer for a licence to show ‘Chasing Ice’ at a community screening which means it will be half-price (£100).